Rajasthan Tourism - the Land of Rajputs is a majestic tapestry of camels plodding over soft sand dunes of the Thar Desert. The landscape of Rajasthan is dotted with island palaces gleaming on idyllic blue lakes; temples and fortresses situated on hilltops of the rugged and rocky Aravalli; strong testimony of Rajput dynasties; and well laid out gardens which add to the grandeur and charm of this majestic land. The royal cities of Rajasthan like - Jaipur, Udaipur, Jodhpur, Bikaner, Kota, Pushkar, Ajmer, Bundi, Chittorgarh, Ranakpur, Jaisalmer and the charismatic Shekhawati Region - add to the attraction of Rajasthan. Location: The city of Ajmer is located in Rajasthan, 130 km southwest of Jaipur. It is flanked by the Ana Sagar Lake on one side and the Aravali range on the other. Ajmer is drained by the Luni River and by the tributaries of Banas River. 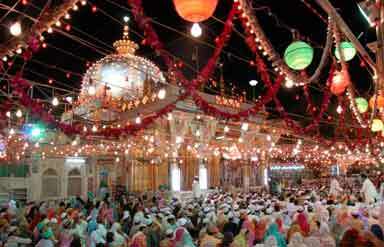 Tourist Destinations: Ajmer is famous as a pilgrim place. It houses the Dargah or tomb of the Sufi Saint Hazrat Khwaja Moinuddin Hasan Chisti. Millions of pilgrims from all over the world throng to Ajmer to visit the tomb every year. The city also boasts of a number of monuments belonging to the Mughal era. It is also known for its traditional handicrafts. The Ana Sagar Lake and Daulat Bagh are other important sites within the city. Ajmer also has an imposing fort built by Akbar. It also houses the government museum within it. The Nasiyan (Red) Jain Temple built in the 19th century is also worth paying a visit. Tourist Destinations: Ajmer is famous as a pilgrim place. It houses the Dargah or tomb of the Sufi Saint Hazrat Khwaja Moinuddin Hasan Chisti.Millions of pilgrims from all over the world throng to Ajmer to visit the tomb every year. The city also boasts of a number of monuments belonging to the Mughal era. It is also known for its traditional handicrafts. The Ana Sagar Lake and Daulat Bagh are other important sites within the city. Ajmer also has an imposing fort built by Akbar. It also houses the government museum within it. The Nasiyan (Red) Jain Temple built in the 19th century is also worth paying a visit. Location: Bundi is located in the southern part of the state of Rajasthan, in the northwestern part of India. It is located amidst a hilly terrain, near a gorge. 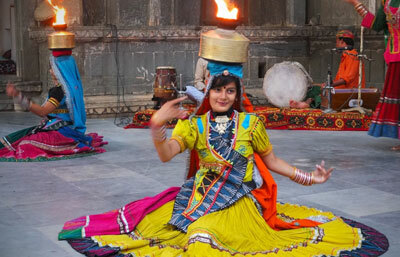 Tourist Destinations: Bundi is famous for its monuments, its fort and especially its waterworks. The Taragarh fort, built in 1354, with its imposing stone structure is situated on a steep hill and has massive battlements and ramparts. Once inside the fort, the Bhim Burj, the largest battlement, and a huge water reservoir carved out of solid rock can be seen. Bundi palace adjacent to the Taragarh Fort is known for its traditional murals. It has a number of impressive baolis or step wells. Raniji-ki-Baoli, (Queen's step well) is a 46-m-deep step well, built in 1699 by Queen Nathavatji, and is known for its carvings. Nawal Sagar, the artificial lake near the palace is a good tourist spot. Other waterworks worth visiting are The Nagar Sagar Kund, Dhabhai Kund and Bhora-ji-ka-Kund. The Sabzi Mandi (vegetable market) within the old town and an 84-pillared cenotaph are some other must visits. Location: Chittorgarh is located in the southern part of Rajasthan beside a high hill near the Gambheri River. Tourist Destinations: The main tourist attraction of the town is its fort, located on a steep hill beside the modern township. Rana Kumbha Palace, the Archeological Museum, the Singa Chowri Temple, and the Fateh Prakash Palace and Museum are other must visit places. The Victory Tower or Vijay Stambh built by Rana Kumbha to commemorate his victory over Mahmud Khilji is the most important tourist spot. The Sammidheshwara Temple, Gaumukh reservoir and the Palace of Queen Padmini are important tourist spots to the south of the Rana Kumbha Palace. The Tower of Fame or Kirti Stambh is another important monument. Other tourist spots include the Bhimtal Tank, Neelkanth Mahadev Temple, Meera Temple, Kumbha Shyam Temple, and the 8th-century Kalika Mata Temple. Location: Kota is located in south Rajasthan on the eastern bank of Chambal River and is drained by its tributaries. Kota is on a high sloping tableland forming a part of the Malwa Plateau. The Mokandarra hills run from southeast to northwest axis of the town. Tourist Destinations: Kota is known for its palaces and gardens. The city fort and palace, one of its main attractions, is located on the eastern banks of the Chambal River. This fort-palace complex is one of the largest in the state of Rajasthan. The museum within the city palace is worth visiting, as it houses a good collection of artifacts. Kishore Sagar tank, located near the palace is also an important tourist attraction. The little Jagmandir palace, built on a small island at the center of this tank is another tourist place. Other tourist spots in Kota include Brij Vilas Palace Museum, the Chambal gardens and the Chhattar Bilas gardens. Situated at a height of 1200 meters above sea level, Mount Abu is the only hill station in Rajasthan. This beautiful town, which is located at the southern tip of the Aravalli hills, is one of the most beautiful places in Rajasthan. Mount Abu is also known for its Dilwara Temples and the annual summer festival that attracts thousands of tourists from all over the world. A very important pilgrimage center for the Jains since the 11th century, Mount Abu has been home to many saints and sages since times immemorial. Legend has it that Mount Abu is home to the 330 million gods and goddesses of the Hindu pantheon. A number of magnificent and beautiful temples dot the entire landscape of Mount Abu, which was formerly known as Mount Arbud. This picturesque town was the favorite summer retreat of the Rajputs rulers and later the British. The glorious past of this region continues to live in its old temples and monuments that stand out proudly among the green hills. For anyone visiting Rajasthan, it would be a great idea to travel to Mount Abu and explore this beautiful region. The best time to travel to Mount Abu is from Feb. to Jun and from Sep to Dec. Location: Pushkar is set in a valley just about 14 km off Ajmer in Rajasthan. Surrounded on three sides by hills and sand dunes on the other, Pushkar forms a fascinating location and a befitting backdrop for the annual religious and cattle fair. Tourist Destinations: One of the most popular and charismatic fairs of the desert is the Pushkar fair, held on the 11th day of the bright half of the moon. The fair is held during the month of October/November. The most famous temple in Pushkar is the Brahma Temple, the one and only temple dedicated to Brahma in India. A red spire marks the temple, and over the entrance gateway is the Hans (goose), the symbol of Brahma who is said to have personally chosen Pushkar as his place. Another important temple is the Savitri Temple (wife of Lord Brahma) on a hilltop. Other important places to visit in Pushkar are numerous ghats that run down the lake. Location: Ranakpur in Rajasthan is one of the five most important pilgrimage sites of Jainism. Ranakpur is tucked away in a remote valley in the Aravali range in Pali district and boasts of one of the largest and most important Jain Temples in the country. Tourist Destinations: The Ranakpur Jain Temple was built during the reign Rajput monarch Rana Kumbha in the 15th century. The basement is of 48,000 sq. feet area that covers the whole complex. There are four subsidiary shrines, twenty-four pillared halls and domes supported by over four hundred columns. In the assembly hall, there are two big bells weighing 108 kg whose sound echoes in the entire complex. The main temple is a Chaumukh or a four-faced temple dedicated to Adinath. The three other Jain temples in the same complex, including a temple of the Sun God, are all worth a visit. A kilometer away from the temple complex is the temple of Amba Mata. Location: The city of Jaipur is capital of Rajasthan, famous for its colorful culture, forts, palaces, and lakes. Also known as Pink City due to the Pink stones used in the construction of the houses in Jaipur. Tourist Destinations: Hawa Mahal is the best-known landmark of Jaipur. In the heart of the city is situated the City Palace, a blend of Rajasthani and Mughal architecture. The place is now a museum except for one section where the erstwhile royal family still lives. Jantar Mantar is only one of the five observatories constructed by Jai Singh to whom the city owes its name. Central Museum has a large collection of costumes, woodwork, brassware, jewelry, and pottery. 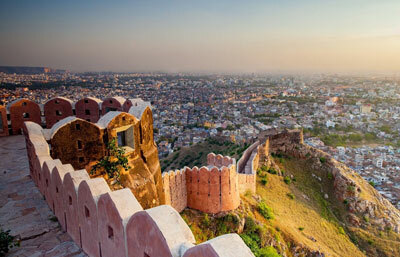 The hilltop forts of Nahargarh, Jaigarh, and Amber constitute the real Rajputana legacy. The Maota Lake offers a breathtaking reflection of the magnificent Amber Fort-Palace. The other places of interest are Jaipur Museum, Albert Museum, Birla Mandir Planetarium, Sisodia Rani Park, Lakshmi Narain Temple, Kanak Vrindavan, The Rajmahal Palace, Rambagh Palace (now a Luxury hotel), and other parks. The city of Jaisalmer shimmers like a mirage amidst the desolate beauty of the hot barren deserts of Rajasthan. It is a small city that can be covered within two hours of leisurely strolling through the lanes and by-lanes, and has an extraordinarily medieval feel and incredible atmosphere. The havelis (mansions of rich merchants) which are the pride of Jaisalmer's architecture and a part of the national heritage should be seen and admired at an unhurried pace. The Jaisalmer Fort, perched atop the triangular-shaped Trikuta Hills, contains some gems of Jain temple buildings, while beautifully decorated havelis are scattered throughout the town. The city is also famous for its beautiful embroidery. During the medieval times Jaisalmer made rapid progress due to its strategic location on the camel trade route between India and Central Asia. Even now, especially after the two wars with Pakistan, its strategic importance has led to the building of national highways, a railway track, and an airstrip, and brought Jaisalmer within easy reach of the people. The climate of this city is of typical desert character. Temperatures range between 46°C and 35.4°C in the summers, and 14°C and 2°C in the winters. 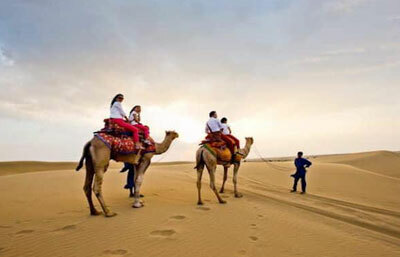 The best season to visit is between October and March, especially between January and February when Jaisalmer becomes a hub of tourist activities during the desert festival. Location: Jodhpur is the second largest city of Rajasthan. Jodhpur is famous for its magnificent forts and palaces. 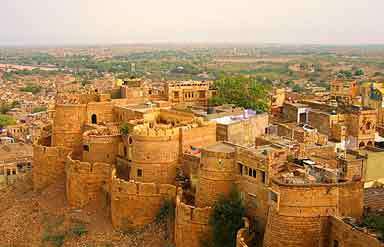 It is situated at the edge of the Thar Desert with Jaisalmer on its west, Barmar, Jalor and Pali on its south, Bikaner on its north, and Nagaur on the eastern side. Tourist Destinations: The Mehrangarh Fort is a living testimony of the military might of the Rajputs. Umaid Bhawan, the only 20th-century-built palace, was constructed to give employment to the famine-struck population of Jodhpur. The Jaswant Thade is a shrine built in memory of Maharaja Jaswant II in 1899. Mandar Garden was the ashram of Rishi Mandu. This garden has a gate known as the Ajit pole. Giridkot and Sardar Market, located in the heart of the city, are popular for a wide range of handicrafts. About 4 miles away from Jodhpur lay the Balsamand Lake and Garden, an artificial lake built in AD 1159, an ideal place for picnics and excursions. Location: Shekhawati region lies in the heart of the Rajasthan with its principle towns mainly Mandawa, Jhunjhunu, Nawalgarh, Mukundgarh, Dundlod, Fatehpur and Parasurampura known for their forts and havelis. Tourist Destinations: The entire Shekhawati Region is flooded with tourist spots. Founded in the 18th century, the medieval fort of Mandawa dominates the town with a painted arched gateway adorned with Lord Krishna and his cows. The Chokhani and Ladia havelis and the street with Saraf havelis, The Binsidhar Newatia Haveli, The Gulab Rai Ladia Haveli are some of the splendid examples of this region's havelis. Nawalgarh is famous for its fort, built in 1737. Other attractions here include havelis of Anandi Lal Poddar, Aath Haveli, Hem Raj Kulwal Haveli, Bhagton Ki Haveli, and Khedwal Bhavan. Parsurampura has the distinction of having the best-preserved and oldest paintings in the Shekhawati region. Mukundgarh is again a tiny village famous for its fort and havelis. The tourist places at Dundlod include the Jagathia Haveli, Satyanarayan Temple, and Tuganram Goenka Haveli, Dundlod fort and palace. Fatehpur offers Mahavir Prasad Goenka Haveli, Gauri Shankar Haveli, Nand Lal Devra Haveli, and Harikrishnan Das Sarogi Haveli apart from a 17th century baoli. Jhunjhunu is the district headquarters and the largest town in the Shekhawati region. The major attractions in the city include the Khetri Mahal, Bihariji Temple, Modi Haveli, and Kaniram Narsinghdas Tiberwala Haveli. Rajasthan is well connected by air with almost all the major cities of India. There are regular flights connecting the state with the rest of the country. The four airports of the state are, Sanganer in Jaipur, Jaisalmer, Udaipur, and Kota. Rajasthan is well connected by a well-laid rail network. The best option is obviously, the Palace on Wheels, one of the most luxurious trains in the world. Apart from Agra, Palace on Wheels connects Delhi with Bharatpur, Jaipur, Kota, Udaipur, Jaisalmer, Jodhpur, Bikaner, Alwar, Sirohi, Kishangarh, Bundi, Dungarpur, Jhalwar, and Dholpur. Many government and private buses run regularly from Delhi to most of the cities in Rajasthan. Moreover, taxis and other vehicles are also available on hire from many places to the state. 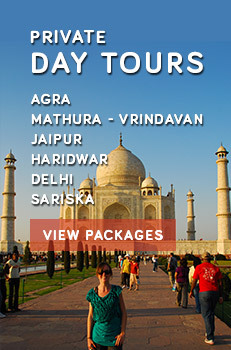 Caper Travel India offers a wide range of Rajasthan Tour Packages. For more details fill up the query form provided.